The average cost of memory care in Montgomery County is $4,586 per month. This is lower than the national median of $4,650. Cheaper nearby regions include Delaware County with an average starting cost of $4,163. To help you with your search, browse the 17 reviews below for memory care facilities in Montgomery County. On average, consumers rate memory care in Montgomery County 3.9 out of 5 stars. Better rated regions include Bucks County with an average rating of 4.5 out of 5 stars. Caring.com has helped 11 families in Montgomery County find high-quality senior care. To speak with one of our Family Advisors about memory care options and costs in Montgomery County, call (855) 863-8283. Located to the northwest of Philadelphia, Montgomery County's population of 826,075 includes 142,910 seniors age 65 or older, which is the prime demographic for people living with Alzheimer's disease. Many of those seniors may benefit from living at an Alzheimer's Special Care Unit (SCU), as Pennsylvania assisted living facilities that treat memory care patients are known. Montgomery County has 20 of these SCUs within its borders that are overseen and licensed by the state's Office of Long-Term Living, which regulates these facilities. Pennsylvania doesn't tax the retirement income of residents who are 60 years and older, including their 401(k) accounts, Social Security payments, and pensions. The low state sales tax and the senior-friendly tax exemptions may help families stretch their budgets to put more money toward memory care. Montgomery County is home to world-class medical facilities, including those specializing in brain health and dementia care, such as Pennsylvania Hospital and Temple University Hospital, in the event of medical emergencies or illness. During an average year, Montgomery County receives 47.4 inches of rain compared to the U.S. average of 39 inches, so family members with mobility issues visiting loved ones in memory care may find this wetter weather challenging. Montgomery County gets 19 inches of snow annually, compared to the national average of 26. Summer temperatures reach 86 degrees, and the winter lows are around 23. Montgomery County scored 51 Sperling's Comfort Index rating, just better than the national average. The overall cost of living in Montgomery County is 25 points lower than the U.S. and Pennsylvania median figures of 100. Housing is very high at 160, compared to state and national averages of 89 and 100, respectively, while healthcare is 15 points above the U.S. norm. Groceries average 100 points, transportation is 110, and utilities are 107. Families of seniors with dementia and on a fixed income may find it necessary to restructure their budgets to allocate more money for quality healthcare. Memory Care costs in Montgomery County start around $4,586 per month on average, while the nationwide average cost of memory care is $4,800 per month. To see a list of free memory care resources in Montgomery County, please visit our Assisted Living in Pennsylvania page. 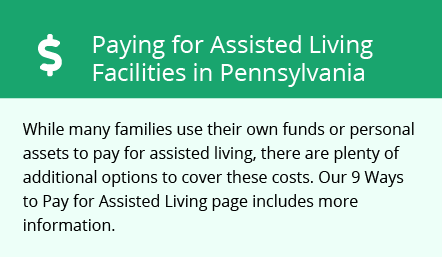 Montgomery County-area assisted living communities must adhere to the comprehensive set of state laws and regulations that all assisted living communities in Pennsylvania are required to follow. Visit our Memory Care in Pennsylvania page for more information about these laws.